The Judicial Council on Wednesday relieved Chief Justice (CJ) Gopal Prasad Parajuli of the top post of judiciary citing he has crossed the retirement age based on his citizenship and academic certificates. Judicial Council (JC) Secretariat today announced that Parajuli has already retired on age ground. A letter signed by Judicial Council Secretary Nripdhoj Niraula and submitted to Parajuli has confirmed that the CJ retired on August 5, 2017. “According to a secretary level decision of March 14, 2018, we inform that respectable Gopal Prasad Parajuli no longer remains in the post of Chief Justice as he has crossed the retirement age of 65 on August 5, 20017,” read the letter issued by JC Secretary Niraula. 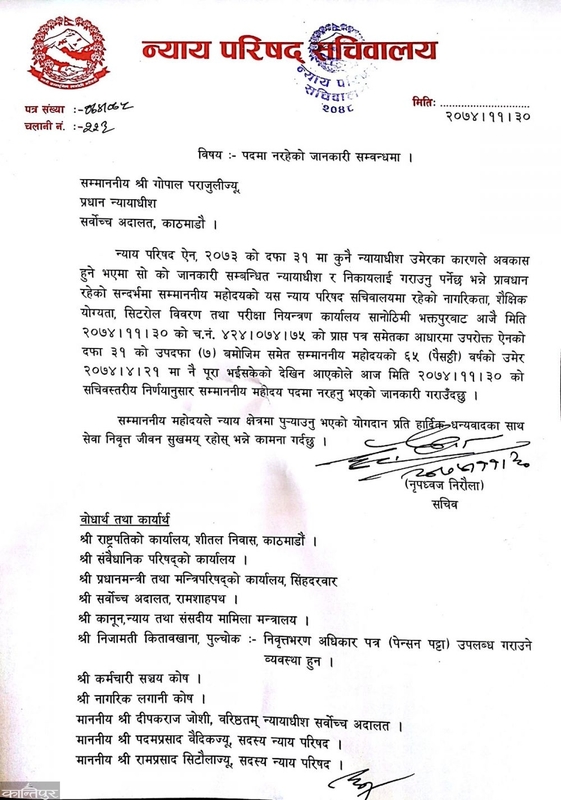 The letter has stated that the decision was made based on Parajuli’s citizenship at the secretariat, his academic qualifications, details and letter received from Examination Controller’s Office in Sanothimi, Bhaktapur. The JC’s decision comes in the wake of controversy surrounding CJ’s date of birth and widespread condemnation of his move to issue pre-censorship order against press for writing news. CJ Parajuli was under pressure from his own team of justices to either resign or stay away from the judicial process after nine justices boycotted the benches assigned to them. The Judicial Council-Act 2077 has a provision to inform the concerned justice and government bodies a justice is retiring on age ground. The letter has been sent to the President’s Office, Constitutional Council, Prime Minister’s Office and Cabinet, Supreme Court, Ministry of Law, Justice and Parliamentary Affairs, and Department of Civil Personnel Records. Likewise, the Employees Provident Fund, Civil Investment Trust, Senior-most SC Justice Deepak Raj Joshi, JC members Padam Prasad Baidik, and Ram Prasad Sitaula have also been informed. Earlier on Monday, SC Justice Cholendra Shumsher Rana boycotted a seven-member full bench that was hearing the contempt of court case against Kantipur daily, stating that CJ Parajuli has already crossed his retirement age.